goTenna, the mesh networking company at the forefront of decentralized communications technology, today announces that TxTenna is now available to the general public on the Google Play Store. TxTenna is the first and only platform that allows for truly decentralized bitcoin transactions, allowing users to send bitcoin without an internet connection, cell signal or any other sort of centralized connectivity. The app was built by the makers of Samourai Wallet, the world’s most advanced and secure bitcoin wallet, and leverages goTenna’s Aspen Grove mesh protocol and goTenna Mesh devices. TxTenna enhances the privacy, accessibility and censorship-resistance tenets central to the global Bitcoin network. While lauded as one of the most private and secure types of currencies available, the majority of bitcoin transactions are all still routed using traditional Internet ‘broadcasts’ that travel through centralized carriers and ISPs that can censor or record metadata for every transaction. In the United States and Europe, these carriers and ISPs are consolidated to just a few major providers, who control consumer access to those services and do so sometimes at the peril of public safety. In other countries throughout the world, these networks are often state-controlled and subject to censorship, surveillance or even being shut off. 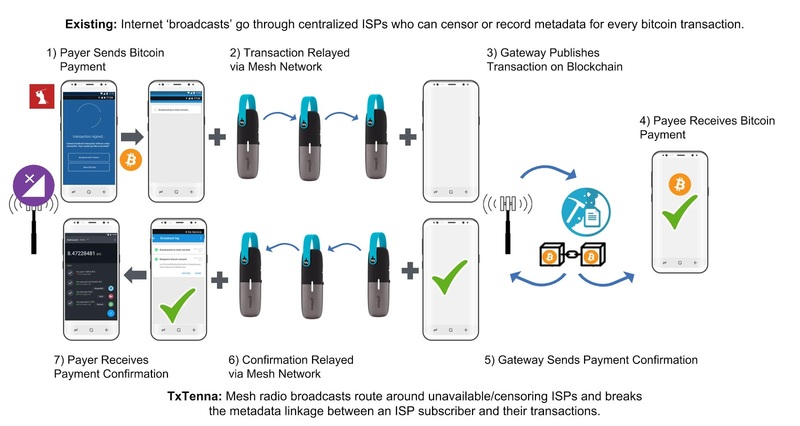 TxTenna was built using goTenna’s SDK (Software Development Kit), an open-source platform for creating unique applications of goTenna’s mesh networking technology. TxTenna was first revealed in May 2018 at Consensus 2018, CoinDesk’s annual blockchain technology summit. The news follows on goTenna’s recent release of Push for Help, a first-of-its-kind emergency beacon system that leverages mesh networking to create a digital safety net in times of distress. The free app is available now for Android devices via the Google Play Store, with iOS functionality expected in 2019. Based in Brooklyn, goTenna creates modular mobile ad-hoc networking protocols and devices that are easy-to-use, low-cost and developer-friendly. goTenna was co-founded by siblings Daniela and Jorge Perdomo, whose shared experiences of losing service at a critical time sparked their vision to build an alternative, self-reliant communications network compatible with smartphones. The company is backed by notable investors like Union Square Ventures, Walden Venture Capital, MentorTech Ventures, BBG Ventures (a subsidiary of Verizon), and Bloomberg Beta. Its retail partners include REI, Cabela’s and Academy Sports + Outdoors. For more information, visit gotenna.com.